My blog today is short as I have been travelling back home and trying to land on both feet – running! Today, you can view a video of the Berlin event on September 28, 2017 and find out what the citizens of Newcastle have been doing while I was away – going down to the beach no less. Regular blogs will resume tomorrow. I am now back in Australia and catching up on things. It was great meeting so many different people – some old friends, new friends – at all the events we spoke at during the 18 days travelling around. Thanks to all the organisers of the events who clearly put work into making them happen. Thomas and I surely appreciated that. It was exhausting – we presented at 16 events across 7 countries and 10 cities and in 17 days. I had little time to do anything other than get up early, go out running (to keep sane as much as anything), then attend meetings, functions, events until late into the evening. I hope all those who took the time to participate enjoyed that time. The next tour is coming up in November (to New Zealand) but for now, a sort of normality (as much as it gets) returns. I have a very limited supply of the book available again which I can offer at the author’s discount price. I can offer to Australian readers for $A28 plus $A7 postage – see www.reclaimthestate.org – for details. You cannot turn your back for a second and expect things to stay quiet. While I was away, the glorious citizens of Newcastle went down to my local surf beach (Nobbys) to stage a visual protest against the plans to build the Adani Carmichael coal mine in Queensland, which will cause further damage to the environment, not to mention accelerate the deterioration of the Great Barrier Reef of the coast. The company Adani, an Indian corporate giant has been revealed to have unsavoury links to tax havens and there are extensive allegations of a corporate strategy based on corruption, bribery and environmental destruction. The Australian government, which is captured by the coal lobby, is preparing to give the company around $A1 billion to help its project in Queensland. While the rest of the advanced world is moving out of coal as quickly as possible, Australian governments (federal and Queensland) are proposing to help a dubious foreign investor build one of the largest mines in the world in an extremely sensitive coastal area. Madness doesn’t come any more clearer than that. The mainstream banks have boycotted the project because they know that the majority of Australians are against it and do not want the negative response from their customer base. Here is what they came up with – a human message to the Australian government to stop this ridiculous waste of public money. 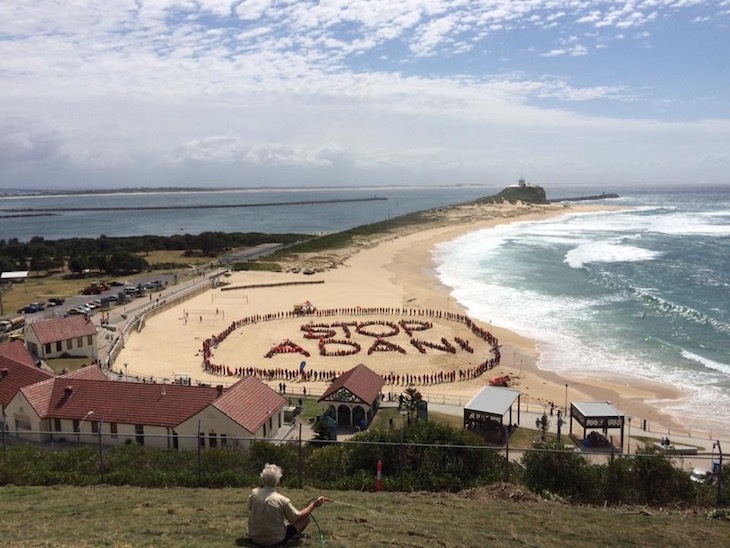 Protests like this were mounted on Saturday all over Australia in 45 locations – along beaches. The dubious dealings of India’s corporate colossus. The Indian police frustrated the attempt by the investigative team from Four Corners to delve into the Indian company. … not accidental violations, the report found deliberate violations, wilful violations. The hope is that the project dies due to lack of funding notwithstanding our own government seemingly intent on wasting public money. The company needs more than the $A1 billion to proceed. Here is an edited video of my presentation in Berlin on September 27, 2017. It shows my presentation and the German translation by Dr Dirk Ehnts. If you just want the English then you have to skip the excellent job Dirk did on our behalf. This event was a joint book launch held in the Neues Deutschland building, which was the original party newspaper of the GDR and was the East German state’s main propaganda arm. It is now a smaller newspaper allied with Die Linke (PDS). The total video runs for around 35 minutes. Any dates/cities planned Bill? Or just Wellington like last time? Thank you for posting the video. I imagine it was difficult to say what you said to that particular audience. But your translator seemed to have a sense of humor- if I ever say anything worthy of translating, I would like to have him do it I think. Turned your ‘English is more efficient’ into ‘German is more precise’ as far as I can tell. Extraordinary recognition of public relations. Thanks Bill for your huge effort to help unwind forty years of neoliberalism and the rule by the corporate oligarchy as well as teach the world how macroeconomics really works. It is a challenge to keep up with your output and I’m falling behind. The Stop Adani rally in Melbourne on the same day, that I participated in, was well attended. Many interesting talks were given and after the forming and photographing of the human ‘Stop Adani’ sign a short concert was held. Melbourne’s public transport was mediocre as always with no trains running between Camberwell and Richmond due to an incident so many made their own way using trams or whatever else. Just one nitpick, the Carmichael mine is a long way inland with a 388km railway line to be built to link it with the Abbot Point terminal. The steel and probably nearly everything else for the railway is coming from South Korea with Posco winning the contract to build the railway and they will apparently receive a share in the ‘toxic asset’ of the Carmichael Mine as part payment. Much of the $1 billion loan from our corrupt federal government will fund this railway. Very few jobs and very little money for Australians in this shambles. It is also estimated based on preliminary data that about 30% of the huge Great Barrier Reef is now effectively dead due to prolonged bleaching arising from sea temperature increases and further rises have already been locked in with the current atmospheric CO2 levels. Realistically all of the world’s warm water coral reefs are expected to be dead in the next few decades unless rapid greenhouse gas emission reductions occur starting now. Tony Abbott also recently said in a speech to climate change denialists in London that “climate change itself is probably doing good; or at least, more good than harm”. Australia is as much a banana republic as any developing world nation. Your statement about the protesters giving a message “to stop this ridiculous waste of public money.” Sounds like language you would criticized others for using. Why is it appropriate in this case? My statement about giving a private coal mine nearly a billion dollars of public money to help it render a profit being a “waste” is not inconsistent with anything I have said elsewhere. The government can ‘waste’ money just like the non-government sector can waste money. It depends on what objectives you see as being the target. In the case of public spending, I think such outlays are wasteful if they do not advance general well-being and, rather, in this case, line the pockets of the top-end-of-town. Sadly, in America, we are used to hearing that helping the poor house themselves and eat is wasteful but that it is essential to make sure large corporations get subsidies.